Marrakech is two places: the walled, labyrinthine, thousand-year old Medina, and the relatively modern city that sprawls around it. The airport, train station and plush hotels are in the outer city. 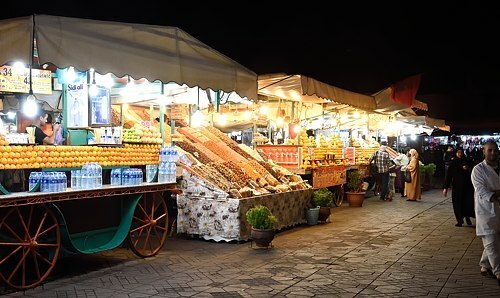 The Medina has all the tourist color: mules tugging carts through open air souqs; alleys twisting between pink adobe riads; passersby in hijabs, djellaba, fezzes and other exotic-to-Western-eyes clothes; the bustling Jemma el-Fnaa central plaza. Au contraire, fellow tourist; it probably costs less. 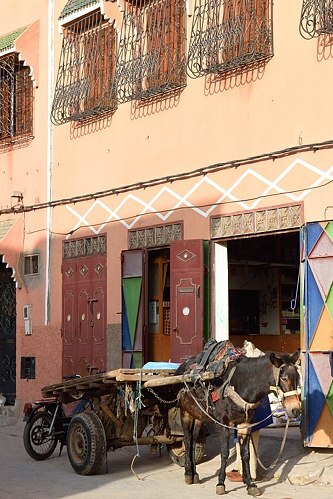 The Medina is chock full of traditional Moroccan homes — aka riads — that have been converted to lodging. My riad had consistent hot water, which put it a notch ahead of a riad described by fellow tourist Angela. 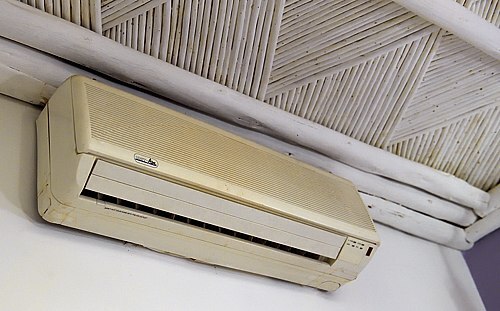 Looks like an A-OK air conditioner to you? Stay in the Medina. Think it too primitive? Look for a ritzier hotel in the outer city. I didn’t get lost in the Medina, which makes me an odd character. (You already knew that.) The narrow, winding, curlicue streets were designed a millenia ago to confuse invaders. This post describes my high-tech Medina-roaming technique. If it fails to appeal, consider adding a safety cushion to Marrakech itineraries; you’re likely to get lost eventually. Don’t expect to buttonhole locals for navigational help, unless you speak French or Arabic. 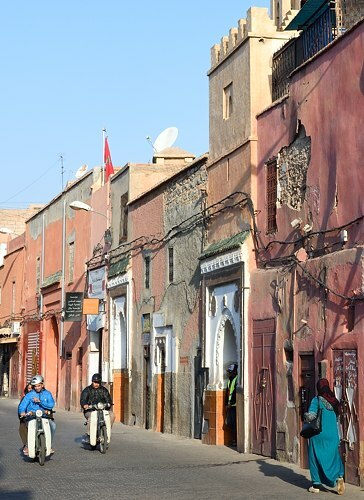 The Medina’s charms are constantly despoiled by the raucous buzzing about of motor scooters. These maraud through the narrowest alleys at all hours, threatening life and limb of natives and visitors alike; pedestrians must hug the right side of alleys to avoid being clobbered. I was brushed by a couple of motorbikes, but never decked, and am confident I would have survived a collision. The bikes are dinky, after all, can’t gain much tourist-walloping momentum in the serpentine streets. Moroccans treated me splendidly, in Marrakech, Casablanca and points between. I heard no grumbles from fellow tourists of slights or discourtesies. Only after my return did I discover a decade old survey indicating that many Moroccans regard America with disfavor. I heartily recommend the ONCF train from Marrakech to Casablanca, despite the bottomless toilets found therein. I bought my ticket without wait or effort at Gare de Marrakech the day before I left, chose between bihourly trains for the three and a half hour ride. 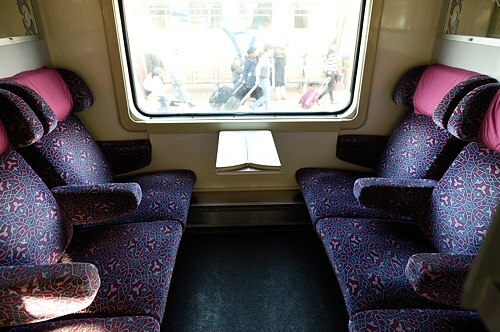 Here’s the car you’ll sit in if you ride first class, as I did. I felt too often that I was gawking, and may hesitate to return for that reason. I speak no Russian or Greek, but didn’t feel so different from the Muscovites and Athenians around me while strolling their cities or riding the metro. 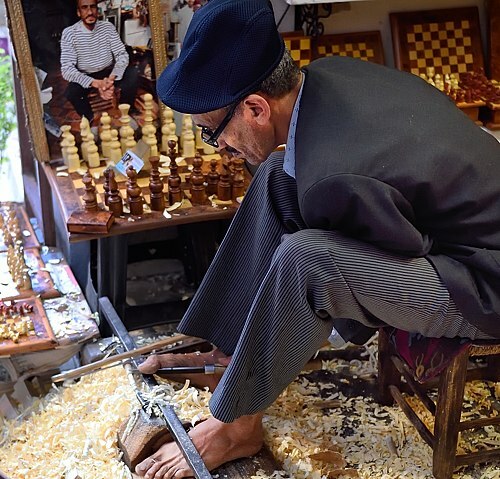 In Marrakech, I faced a cultural chasm I couldn’t bridge. The country is poor, with a GDP of $3,250 per person and a 67% adult literacy rate, a notch below India and Angola. I struggled to relate to the natives in so-unfamiliar-to-me dress, and too often caught myself regarding them as I might regard costumed theme actors at Disneyland: two dimensional, not completely human, part of the picturesque scenery, as if dressed in fezzes and djellaba to entertain me. Tourists bring money, often the most lucratively obtained money to be had, so many natives play to that audience: bringing snakes to the Jemaa el-Fnaa, for instance, not because anyone seriously tries to charm snakes but because a chuckling blond with a Fodor’s guide will pay a few dirham to photograph a local holding one. But: that’s where the money is; tourism is a major national industry, brought in nearly seven billion USD in 2013. 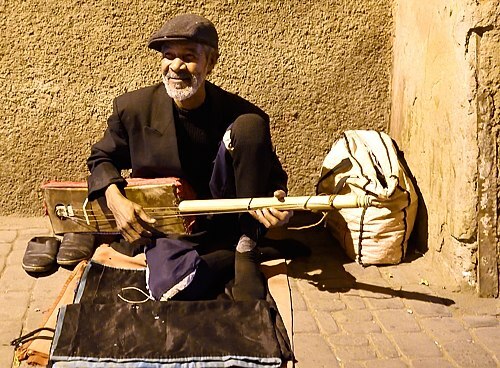 If I want to help the Moroccan on the street, I can support a charity like Amal, or simply encourage you to visit and spend money there, and keep my misgivings to myself. Practical information: No visa needed by Americans for visits under ninety days. INWI will sell a prepaid SIM card for your smartphone at the airport; I think you’ll find a Maroc booth here, too. 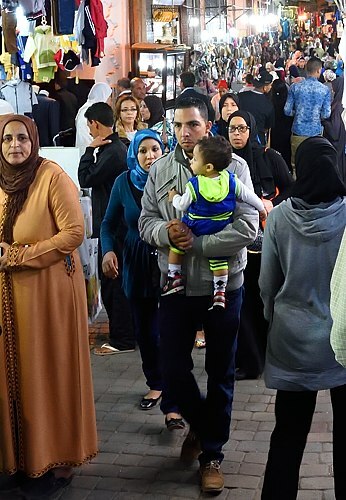 With that prepaid sim and a GPS signal, you can dare a ride on the 19 bus into the Medina. Without GPS, you’re likely better off taking that first trip by cab. The Medina interior is a much steeper challenge for the GPS-less visitor than the more modern Marrakech outside the Medina walls. I did all my Marrakech getting-around on foot after that first 19 ride, but still congratulated myself for bringing along a city bus route map, just in case.